It is not possible to fully evaluate a medium whilst immersed in said medium. One fish asks another fish "How's the water?" The other fish replies, "What the hell is water?" 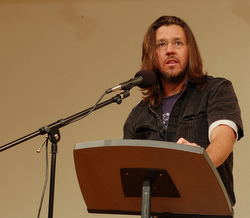 David Foster Wallace commencement address given to the graduates of Kenyon College in 2005. (If anybody feels like perspiring [cough], I'd advise you to go ahead, because I'm sure going to. In fact I'm gonna [mumbles while pulling up his gown and taking out a handkerchief from his pocket].) Greetings ["parents"?] and congratulations to Kenyon's graduating class of 2005. And the two young fish swim on for a bit, and then eventually one of them looks over at the other and goes "What the hell is water?" Here is just one example of the total wrongness of something I tend to be automatically sure of: everything in my own immediate experience supports my deep belief that I am the absolute centre of the universe; the realest, most vivid and important person in existence. We rarely think about this sort of natural, basic self-centredness because it's so socially repulsive. But it's pretty much the same for all of us. It is our default setting, hard-wired into our boards at birth. Think about it: there is no experience you have had that you are not the absolute center of. The world as you experience it is there in front of YOU or behind YOU, to the left or right of YOU, on YOUR TV or YOUR monitor. And so on. Other people's thoughts and feelings have to be communicated to you somehow, but your own are so immediate, urgent, real. DAVID FOSTER WALLACE in his own words As I'm sure you guys know by now, it is extremely difficult to stay alert and attentive, instead of getting hypnotised by the constant monologue inside your own head (may be happening right now). Twenty years after my own graduation, I have come gradually to understand that the liberal arts cliché about teaching you how to think is actually shorthand for a much deeper, more serious idea: learning how to think really means learning how to exercise some control over how and what you think. It means being conscious and aware enough to choose what you pay attention to and to choose how you construct meaning from experience. Because if you cannot exercise this kind of choice in adult life, you will be totally hosed. Think of the old cliché about "the mind being an excellent servant but a terrible master".